The Stevenson School for Ministry is here to help you with your parish formational needs! Discernment is for the entire Body of Christ. God calls all the baptized into ministry. Our Discernment Modules can be an excellent way of exploring the ministry of the baptized in your parish! Module I: Meeting God’s Call: Who is the God Who is Calling Us? The Rev. Canon Kate Harrigan facilitates these modules and would be delighted to work with you in running them in your parish. For a more detailed description of the modules, click here. For more information about this course Celtic spiritual practices, please contact Dr. Mark Scheneman by clicking here. For more information about this course on racial justice, please contact Mr. Kevin Barron by clicking here. For more information about this course on parish leadership development, please contact The Rev. Canon Dan Morrow by clicking here. Want to dive deeper into Scripture, theology, liturgy, the history of the Episcopal Church? 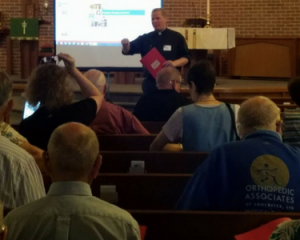 We offer a wide array of in-depth courses that could meet the formational needs of your parish. Many of these courses utilize Zoom, a video teleconferencing program, that allows live interaction with the faculty member. So whether you are in the Northern Tier or the Southern Convocation or anywhere in between, our outstanding faculty can come right to you via Zoom! For our current course offerings, click here. The Anglican Way: an introductory course on Anglican history, theology, and liturgy that could be useful for newcomers. Reading Spiritual Practices for Today: a course that gives a sampling of various spiritual traditions such as Ignatian, Franciscan, etc. If you are interested in using SSFM for your parish formational needs, we are here to help you. We would be delighted to talk with you about using SSFM in your parish. Please contact Dean Robyn Szoke-Coolidge for more information by clicking here.